I've been to most of the formations shown in the map above, but had never shucked my way out to Oyster Bar. I was hoping to find some interesting rock formations, perhaps some evidence of ancient Native American activity, or maybe an old ranching/mining relic. Here's some pics I took along the way. Just a few steps away from the truck, this great view presented itself. 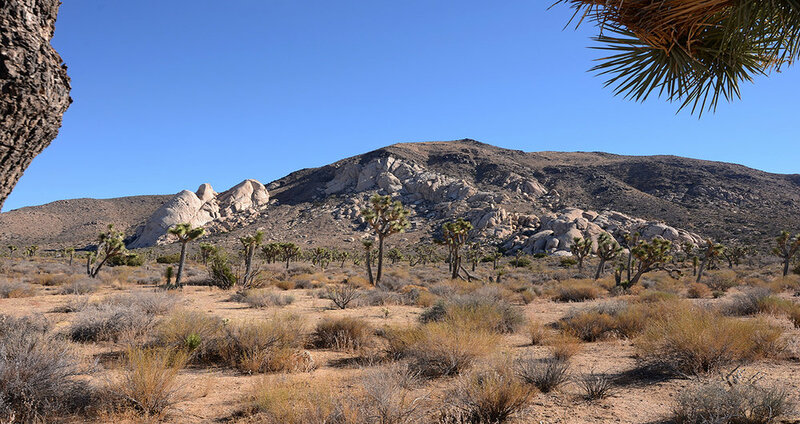 The large formation on the left is Saddle Rock, the formations near the top of the hill and just to the right of Saddle Rock are the Cowboy Crags and the pile of boulders at the right make up the Oyster Bar area. And that's where I was heading. Swinging wide to the right, I climbed a small rise southeast of the Oyster piles and took in the view. 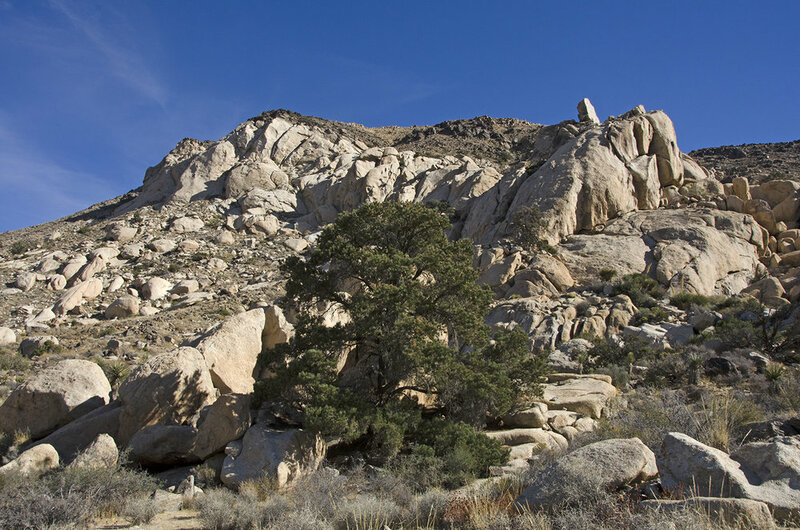 The large chunk of granite in the left foreground is Target Rock and the boulder across the small canyon to its right is known in the parlance as Conrad Rock. I continued sweeping to the right. This shot was taken on the southwest side of the rocks, and I would have loved to have seen it when those Nolina blooms were all fresh. The smile on this rock reminds me of the T-Rex in Jurassic Park. So I named it T-Rex Rock. So after a bit of aimless wandering, it was time to head down the slope and check out the other side of the 'Bar. But before reaching the bottom of the slope, I took this pano of the valley before me. 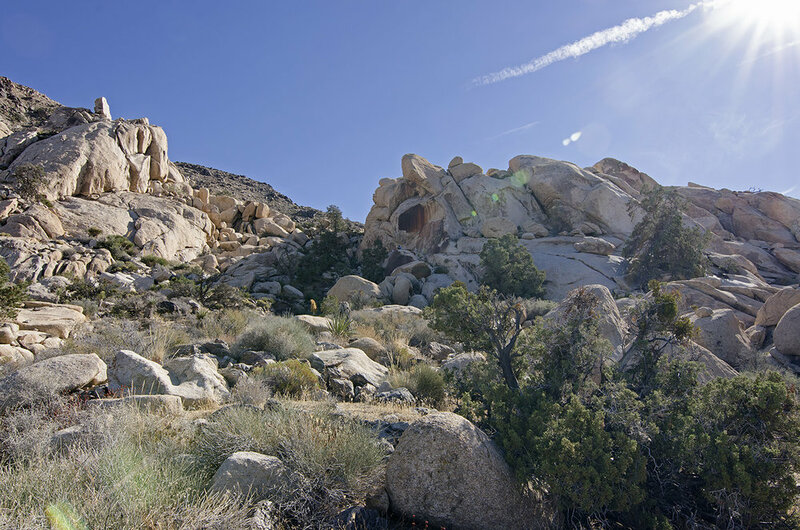 From left to right, the rock formations are: Ryan Campground area (which includes Headstone Rock), Cap Rock, Planet X area and at the far right, a small portion of the Hall of Horrors. 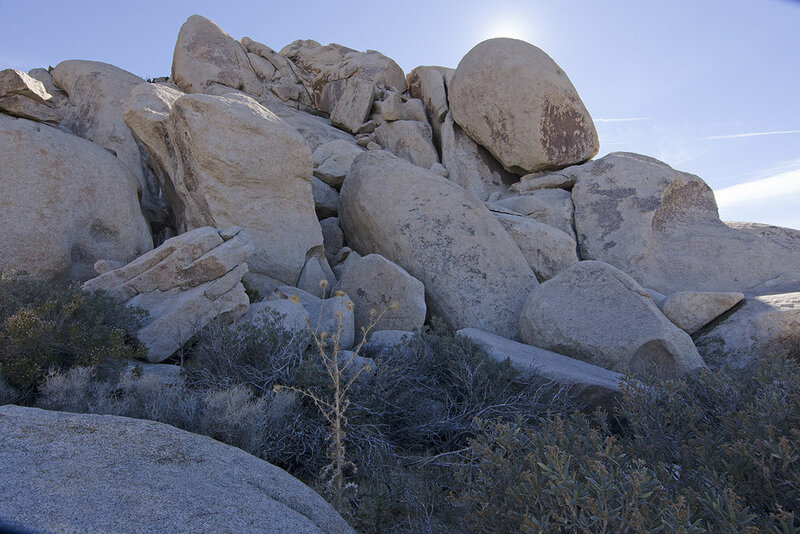 The western face of Target Rock. Here is a portion of the north side of Target Rock. 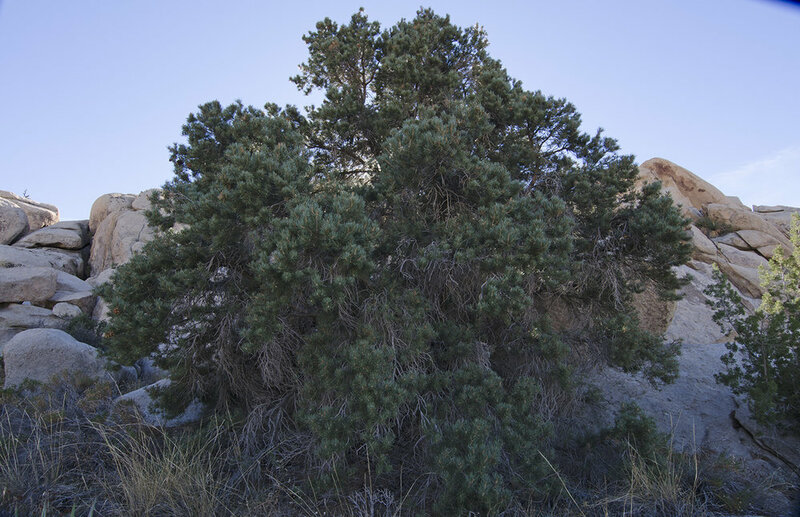 One of many large Pinyon Pines in the area. Don't these birds know that Quail Springs is west of here? The large face of rock at about 1:00 is the actual Oyster Bar rock. If you wanted to climb to the top, you could choose such routes as Clam Shell, Stress Puppet, or even Oysters from Heaven. Me? 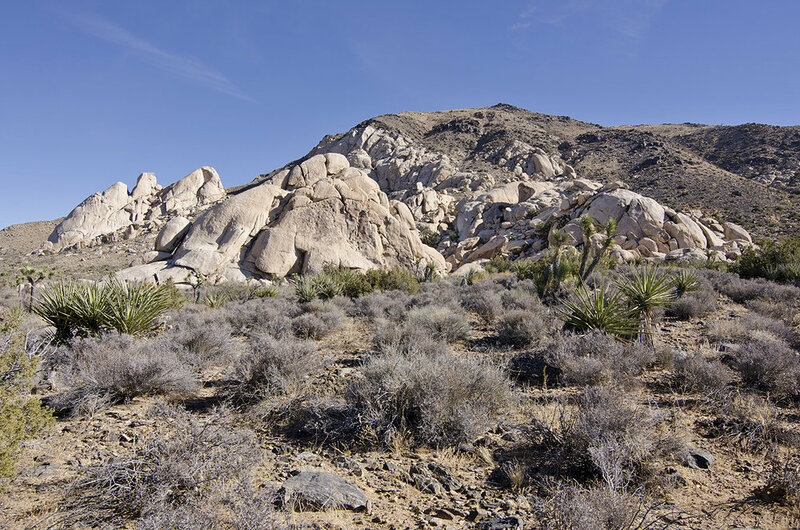 I'll just stay on the desert floor and be content with some low-level scrambling. Agent Orange Rock is easy to pick out, with the large areas of orange tinged rock on its northeast side. A few of the memorable climbing route names in this area are The Iron Curtain, Bloody Knuckles, Rust in Peace and Pears Before Swine. A nice view of Saddle Rock, had to take it. Time constraints required me to turn around at this point and start the trek back to GrayTac, but I'll be returning at some point to head up into that area between Oyster Bar and Agent Orange, to see just what else I can find up in those hills. But not before adding this last shot, another beautiful Pinyon Pine, with Oyster Bar and the Cowboy Crags meeting the contact zone. Ok, the actual last shot for this post. That line of rocks? The mysterious Planet X area.